During the years I lived in Delhi, I discovered many new places to indulge in my appetite for kababs. Having been the capital of India during the reign of multiple emperors during it's rich past, Delhi has inherited a treasure trove of culinary secrets from the royal chefs who practised their art here. While in Delhi, I also began visiting some of the best-known upscale dining destinations. I was finally making enough money to pamper myself with such luxuries! The rest of this post describes the five best in and around Delhi. While some like Karim's have been around for generations and is moderately priced, others like the Dum Pukht are upscale and expensive. This eatery is run by the direct descendents of chefs employed by the Mughal emperors. 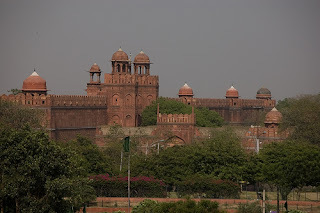 Their royal employment came to an end during the year of mutiny 1857, when the last Mughal King Bhadur Shah Zafer was dethroned by the British. Apparently, Karim's ancestors fled from the Lal Qila and took shelter in Uttar Pradesh. In 1911, when the Delhi Durbar was held for the coronation of King George V, they moved back to open a Dhaba for the people coming from all over India to watch the coronation. Subsequently, the Karim Hotel was established in the Jama Masjid area of Delhi. Today, the fourth generation runs this popular eatery which has branches in other Delhi and Noida locations. For kabab lovers, I'd recommend the Mutton Burra (succulent pieces of mutton cooked in an oven); trust me, this is the softest mutton kabab you will have ever eaten! 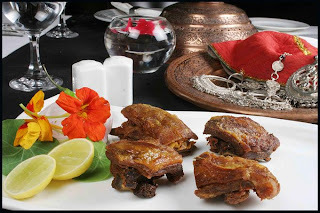 You can also try the Mutton Raan (thigh of a goat) that is good for a group of four. Alternately, try the Seekh Kababs, Shammi Kababs or the Mutton Tikka Kababs. If you prefer chicken, sample the Chicken Seekh Kabab, Tandoori Chicken or Chicken Tikka. The kababs are larger than those you get in the usual Delhi dhabas, and I particularly love the Shami Kababs (even though they are different from the tangy Lucknowi variety). Since I love biryani, I always follow up the kababs with some Gosht Biryani. But if you prefer breads, I would recommend the Khamiri Roti which is prepared with wheat flour and yeast. Alternately, you could order Keema Parantha (parantha stuffed with minced mutton) or even the usual roomali rotis, butter nans and paranthas. Karim's serves two main desserts that are exceptional. Kheer Benazir (prepared with milk, broken rice, sugar) and Shahi Tukda (fried bread soaked in condensed milk) which are both delicious and complement the rest of the meal. I have heard that the most exclusive dish at Karim's is the Tandoori Bakra, a full goat stuffed with dry fruits, basmati rice, minced meat and spices. Served amid stone walls, rough-hewn dark-wood beams, copper urns, and blood-red rugs, the food is so mind-blowingly delicious that it hasn't changed in the last 25 years. The cuisine of the Northwest Frontier - now the border between Pakistan and Afghanistan - is heavy on meats, marinated and grilled in a tandoor (clay oven). Staff here are immensely proud of the fact that Bill Clinton apparently chose to stay at the Maurya Sheraton "because of our restaurant". Hardly surprising then, that Restaurant Magazine rated Bukhara as one of the 50 best restaurants (and best Asian restaurant) in the world in 2004. Mar 2008 Update: Updated review and pictures from the Bukhara here. The murgh malai kabab (boneless chicken marinated with cream cheese, malt vinegar and green coriander) is unforgettable; red-meat lovers find the tender sikandari raan (leg of lamb marinated in herbs) equally heavenly. Bukhara's dal (black lentils simmered overnight with tomatoes, ginger, and garlic) is so famous it's now sold in cans. 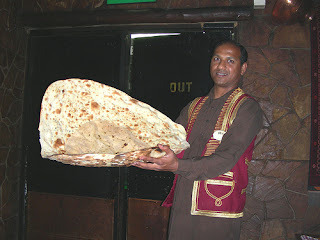 You can also order the super-sized Naan Bukhara, a single one of which is good for a party of five! You are encouraged to eat with your hands after wearing red-checkered aprons. There are other delicacies on the menu with their own character and history, offering a specific pleasure. Delicate chicken kebabs, one variety stuffed with fiery green chili, another a milder version filled with soothing cheese. 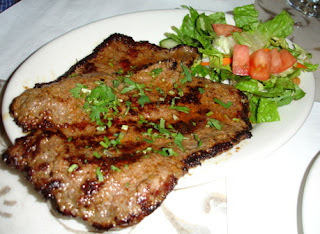 Lamb served in diffent ways: A tender, tiny mutton chop marinated with black pepper and figs, then pan grilled and finished in a covered pot sealed with dough. A slow charcoal fire applied from the top, and a slow live fire from the bottom, makes a dish that was juicy, full-flavored and aromatic. Then there are the gorgeous, bright green discs of shami kebab, dainty patties of spiced, finely minced mutton wrapped with betel leaves and pan-grilled. The result is amazing! And finally, river fish that arrives minced, with cheese and onions, flavored with garam masala and grilled in the pan. You can wash all these delectible kababs with jal jeera, a digestive drink made of tamarind water, roasted black pepper, cumin seed, fresh mint and lemon juice. The "neat" version is delicious, as is one enlivened with a touch of vodka! Before you go, stand at the kitchen window to examine the kebabs and naans as they are taken from the ovens. You can also talk to the chef, Sultan Mohideen, who oversees the kitchen. This 'factory' at the Radisson Hotel, New Delhi serves 150 types of kebabs and they keep on coming. Made and served in imaginative ways, you can eat as many as you want for a set price. The kebabs are accompanied in a traditional thali (platter) with three kinds of vegetables, a non- vegetarian curry dish, chutney, dal (pulses), salad, Indian sweets and Indian breads. The selection of kababs varies on any particular day, but they are all very succulent and grilled just right on the tandoor. The breads are particularly delectable; many of them - such as the taftan, sheemal, etc. -- aren't easily available elsewhere. The dining area is surrounded with curios from factories and the kitchen area is separated only by a glass wall. The 'factory' theme is underlined by the uniforms of the waiters and the heavy, mettalic flatware and china. The Kabab Factory concept of limitless kababs from a pre-fixed menu became so popular that they have since opened another restaurant in NOIDA. And this concept has also been copied by other restaurants; I know of two in Pune itself. Like the nawabi (princely) culture from which it's drawn, the food and style at this restaurant are subtle and refined. The menu is embroidered on a silk scroll, and the restaurant is decorated with silk drapes and cushions. Chef Imtiaz Qureshi, descended from court cooks in Avadh (Lucknow), created the delicately spiced meals packed with flavor: dum ki khumb (button mushrooms in gravy, fennel, and dried ginger), kakori kabab (finely minced mutton, cloves, and cinnamon, drizzled with saffron), and the special raan-e-dumpukht, a leg of mutton marinated in dark rum and stuffed with onions, cheese, and mint. The kakori kababs here melt in your mouth and the Dum gosht biryani is a gourmet's delight. The formal room is white, blue, and hushed, and for those who can afford it, a great choice for a cosy, romantic dinner. Among some exotic kababs here are the Sangam galauti, a fusion of chicken and mutton, fired on simmering coal, and the very Lucknowi Noormahal biryani with mutton koftas. BTW, the Dum Pukht restaurant is now available in other ITC Hotels; I recently visited the one in The Grand Maratha at Mumbai. While the menu and decor are quite different from my memories of the one in Delhi, the kababs and biryani continue to be top-class! Chor Bizarre, the perfect spot for dining after a whirlwind rickshaw ride through the market streets of Old Delhi, lives up to its name. A 1927 Fiat Roadster serves as a salad bar. All the china is intentionally mismatched, none of the chairs are the same, a four-poster bed is your dining table, and the walls are loaded with photos of Elvis and Marilyn. Then there is the carved, spiral staircase that goes nowhere. However, the kitsch stops there. The food is fiery, varied and sure to please any lover of Indian food, but especially so for those who enjoy Kashmiri cuisine. The mirchi korma - lamb cooked in hot gravy with kashmiri chilies, cardamom and cloves - is a bit on the heavy side. And of course Gustaba, those velvety spheres of finely minced young lamb flavored with cardomom in an yogurt sauce and cooked on slow fire. The Gustaba is the crowning glory of the Kashmiri Waswan and a recipe known to few. Kabab enthusiasts will love the Sufiani Macchi (velvety morsels of salmon in royal cumin and dill), Gazab Ka Tikka (bite-sized chicken tikka in a unique marinade), Tandoori Bater (quail marinated in hung curd, fenugreek, spices and dry-roasted on live charcoal in a tandoor), and the Tandoori Chaampen (tender lamb chops with fresh ginger and tandoori spices). But the one that I remember enjoying the most is the Tabak Maas, spare lamb ribs cooked in Kashmiri spices and shallow fried (see picture). Bahadur Shah Zafar was the last of the Mughal emperors who ruled from Delhi. A recent book, by William Dalrymple vividly details the 1857 revolt against the British Empire and end of the Mughals in India. The politicians have since taken over Delhi, but the royal legacy of mouth-watering kababs and biriyanis remain! Note: Pictures sourced externally are linked to their owners. OK< so that was a mouthwatering post. I love it. I wish we could find some around here. Sounds delicious. Our local Indian place is South Indian/Sri Lankian cuisine. The description of food and places is so good that I almost was looking for such things on veg cuisines. Being a strict vegetarian myself, I now hope to start a similar blog for veggies. Don't know if i can write this well though. Never read such an exhaustive information on Kababs. I will ensure that I visit these places in my next trip to Delhi. @sank: When you visit India, I will recommend some places you can visit. South Indian cuisine is quite different. @ashutosh: Welcome to my blog! Good luck with your veggie blog. @subbuism: Thanks and welcome to my blog. Very fine post Shantanu..Keep up the good work...I miss Delhi's Junk food.. Very interesting reading. India is one destination I'm yet to make it to. Great blog site. @aditi, @greg: Thanks and welcome to my blog! What a great, educating and readable post. Like you never been to Europe and Norway, I've never been to India. So now we are equal:-) Like you said on mine: I'll be back! I quite like Thea myself - although I prefer their grilled meats, given that I'm a kebab fanatic! If you ever get the chance, try ethiopian food. Its one of the most brilliant cuisines *Ever*. And thanks for stopping by - I've been rather uncertain with my blog entries lately but I think I'm going to get back to it soon enough! @armchair philosopher. Welcome and hope to see you back here! I love this post almost as much as I love food. I'm going to travel to India next year so I'll have to bookmark this. :) Great blog, great layout, great writing. Thanks for sharing. i would love to travel and sample the food from various places thats my dream. Being a housewife i travel to the minimum but try to taste as much as possible the things special to that place. how did you come across my blog? Dum Pukht is a very famous restaurant in Lahore's pearl continent...is the one in delhi owned by same group? @awanish: The Dum Pukht in India is a branded restaurant of the ITC Group of Hotels. This one is at the Maurya Sheraton Hotel, Delhi. have 2 cookbooks on Avadhi cuisine) but some of the more unusual spices and masalas are not available here nor can I find them online. 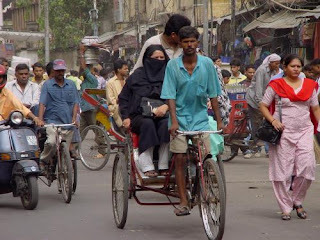 Could you inquire among your friends in Lucknow where the good spice shops are, even stalls in the old city chowk - we can hire a guide to take us in search of the missing ingredients! Many thanks, and I have added your informative travel pages to my favorites to follow regularly. @luvtatravel: Welcome to my blog! Most of the spices ought to be available in any grocery shop (called Kiranas); just make sure you know the Hindi names of these spices. Also, do not buy packaged and pre-ground spices. Grinding whole spices at home (if you have a dry grinder) will give you a much more superior taste. Wonderful blog! I'm looking forward to reading through your archives. I'm learning Indian cooking (via my blog!) 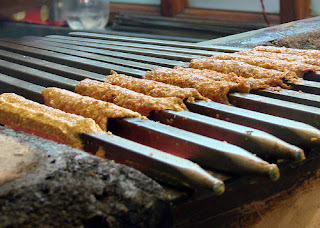 and have yet to try my hand at kebabs... this might just be my inspiration. Thanks! @sarah: Thank you! While I love cooking (as does my wife), we rarely attempt kababs at home. Maybe because the real thing is made in charcoal fired ovens (called tandoor in India) that are usually unavailable in homes. The one place I had great kabab's was this 'gali' in Nizamuddin in Delhi. Go down the little lane next to a Dargah, wind your way past wandering ducks and take your place on a 'charpoy' among afficianados for the most succulent beef kababs ever. Reading your blog reminds me it is now lunchtime - so I am off. Maybe, I will do Kababs today, though Bangalore is not great for the authentic stuff. I've always loved a good kebab! @harinair: Actually there is a Karim's in Nizamuddin too. @swollenpickes: Welcome to my blog. Gr8 experiences shantanu, u seem to enjoy travelling and exploring the world around. We are looking for someone like you. We are from NDTV. Can u call us on 09899777106 before Tuesday, 13th May 2008. We would like to call you as a guest on our show on travel show. It has menus and phone numbers of ~1200 major restaurants in NCR region (increasing day by day). You can search by cuisines or location. Its really convenient. @Joey: I am flattered. But was out of the country when you wrote in! Thanks anyway. @Kanchan: Hey! The site is great. However, I now live in Pune so this won't be of too much help (other than checking to see how much culinary progress NOIDA has made since I last lived there!). This Post on Dumpukht is nicely-written.. you have described the place so well..
well, the "kakori kebab" at Dum Pukht-ITC Maurya Sheraton is to die for.. but, the "kakori kebab" of Dumpukht at ITC Sonar Bangla-Kolkata & ITC Grand Maratha-Andheri,Mumbai were a bit different in taste, not heavenly like that of Maurya Sheraton but still very-good..
i generally have another Dumpukht-favorite of mine, "Jhinga Dil-e-Nasha", made of 6-jumbo-prawns, and surprising it remains the same at ITC Maurya Sheraton & ITC Sonar Bangla.. i haven't tried it yet at ITC Grand Maratha..
and regarding, Dumpukht Biriyani, i found it a marriage between Hyderabadi Dum Biriyani and Lucknowi Gosht Biriyani.. but, the dish is a good-one.. i had "kachhe gosht ki biriyani" at ITC Kakatiya-Hyderabad.. they prepare it much better than Dumpukht Biriyani..
And for BUKHARA, its my favorite restaurant too.. The "Murgh Malai Kebab", "Peshawari Kebab" & the "Bukhara Dal" is unmatched.. i had similar dishes at PESHAWARI- ITC Sonar Bangla (Kolkata) & ITC Grand Central (Parel,Mumbai),, they were too good but in no-comparison with the bigbrother Bukhara of ITC Maurya. @Jaya: Yup, Kareem's and TGKF target different price points. But both are great destinations for kabab fanatics. @Uttiya: Well, I just got back from Kolkata, specifically the ITC Sonar, Kolkata. So, I expect to post my views on Dum Pukht soon. Keep watching this space! What a post..love the way u write. I was in Pune too earlier. Shifted to delhi a while ago and looking for good places to eat out, when i came across this post. Keep writing. @Peanuts: Thanks! Appreciate the comments. Very beautiful and lucid description. Amazing!! @Anon, @Arijit: Thank you! Appreciate your comments. Aw, this was a very good post. Spending some time and actual effort to generate a very good article… but what can I say… I hesitate a whole lot and don't seem to get nearly anything done.